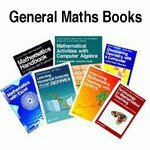 General Mathematics Books available from Chartwell-Yorke - lots of interesting things here like The Mathematics of Juggling, the renowned and highly popular Miquon Maths home educators' books, plus books on logic, programming and the didactics of using technology in the classroom. Please note: book orders placed 3-25 August will be despatched from 26 August due to holiday closure. How I Wish I'd Taught Maths: Lessons learned from research, conversations with experts, and 12 years of mistakes. 'I genuinely believe I have never taught mathematics better, and my students have never learned more. I just wish I had known all of this twelve years ago...'. . Click for more detail. POST FREE IN THE UK. For 30 years, the Miquon Math Materials have offered children a friendly invitation to the world of mathematics. CLICK ON PICTURE FOR FULL DETAILS AND PRICES. The essence of using technology - particularly computer algebra systems (CAS) - in education. By Bernhard Kutzler, 2009. All the dynamic geometry activities from the Key Stage 3 framework document presented as photocopiable activities with Cabri Geometry II Plus.